By Very Rev. Fidel Alvarado, O.S.A. Four years ago, the Augustinian Vicariate of St. John of Sahagun in northern Peru accepted a new challenge, this time delving into education. Those of us who have already taken on this apostolate believe that the Christian education of children and adolescents is crucial. Those going through our schools must be aware of the human need to fill the emptiness that science cannot and that only Christ--our inner teacher--can satisfy. Thus, we are founding a new school in response to a project that the Vicariate has been working on for the past five or six years when Fr. John Lydon, O.S.A. was in charge of the Vicariate as Vicar. It was at the end of our annual meeting, and after many discussions at the meeting about the issue of becoming an economically self-sustaining Augustinian Vicariate, that a group of Brothers submitted a letter to the Vicariate Council requesting that consideration be given to founding a school that would later serve to economically sustain the Vicariate. 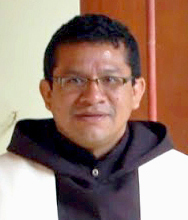 Two years ago, the Vicariate Council appointed a committee made up of Fathers Eleodoro Villanueva O.S.A., Farfán Edinson O.S.A., Ramiro Castillo, O.S.A. and myself, the current Vicar. To tell the whole story of the founding of the new school would have to be written amongst a number of articles. Regardless, I would not want to forget the night of September 7, 2012, when in the Franciscan Brothers’ monastery, the Vicar and his Council called a meeting of the School Committee to declare that work should start now, in the place where the Saint Rita Chapel is currently located, in Santa María a few blocks from our monastery here in Trujillo, Peru. As Augustinians, this school project is a challenge that must be faced with humility, sacrifice, and above all, confidence in God's grace. Fr. Ramiro Castillo was assigned to lead the new project. On February 21st, 2013, after making presentations to the Department of Education, the Municipality, and all other appropriate institutions, we opened enrollment and set tuition for the current academic year of 2013 [Peruvian school year beginning in March]. With the intercession of St. Augustine and Servant of God John McKniff, O.S.A., it did not take long for classes to fill up for our First and Second Grades, but that wasn’t solely because of the work done this past year. It was also partly due to the reputation of the other Augustinian schools in Peru. It was comforting to hear people on the street, in the town square, and in the supermarket when they were given flyers ask: “What does this have to do with the high schools in Iquitos, Lima, and Chiclayo?” “We are from the same Order,” we answered. Others said that it was time that there was an Augustinian high school in Trujillo. Large projects start slowly, but most importantly, we hope that the project achieves our main goals of evangelizing those children, young people, and parents who do not belong to our parishes. The project has already started. The hope is that within four or five years, our students that are prepared for a high school education can then do so in the new school that is to be built. We need to purchase 10 acres for this project, so we will be reaching out to our Augustinian brothers and others for support. We appreciate the support and concern of our Augustinian brothers from North America, especially our Provincial Fr. Bernie Scianna, O.S.A., who always drives us to be close to the poor and to keep the spirit of community alive.